This is a sponsored post written by me on behalf of Tyson® Foods, Inc. The opinions and text are all mine. 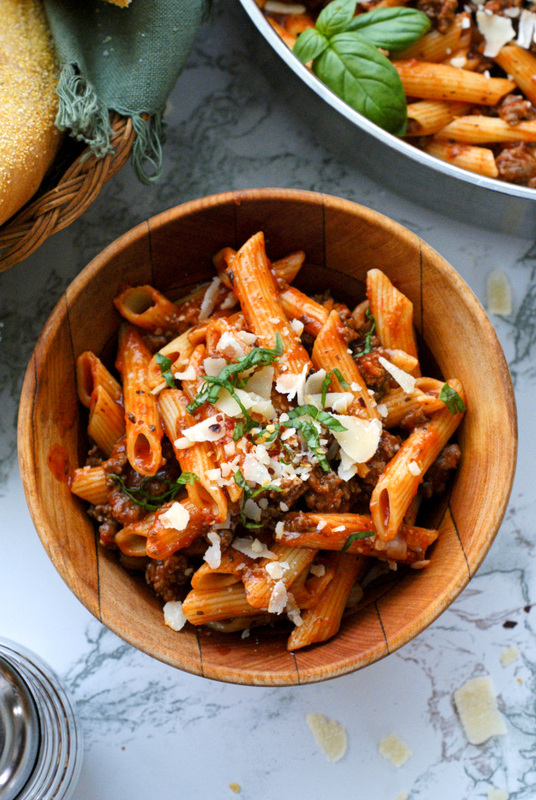 This One Skillet Beef Marinara Penne comes together in just 15 minutes making it an easy and delicious dinner solution for busy weeknights! What's your happy place? You know, like the place where you feel at peace, calm, and complete. For some people, happiness is found with toes in the sand at the beach. For others, it's snuggled up on the couch or hiking in the woods. Want to know what my happy place is? Publix. Yup, as in Publix the grocery store. Everyone has their favorite place to be and mine just happens to be filled with aisles and aisles of food! What can I say? I'm a food blogger! Food is my passion. And Publix? Well, Publix is my fave grocery store evaaaah. If you're a Publix shopper, I know you get me on this one. While browsing the aisles of Publix for hours on end filling my cart with all kinds of my favorite foodie goodies is my idea of a good time, sometimes all I have time for is a quick run in and out to pick up one or two things to make a last minute dinner on a busy school night. 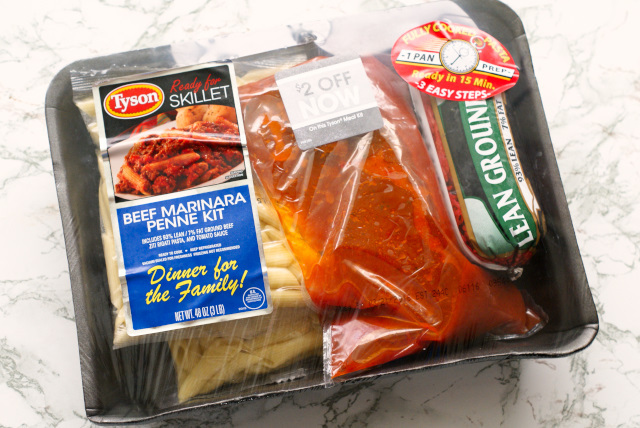 When I need to run into Publix and grab something for a quick dinner when I have no time to spare, all I have to do is zip to the Ready to Cook section of the Fresh Meat case and pick up a Tyson® Meal Kit! These awesome Meal Kits have everything you need to make a complete meal for your fam. 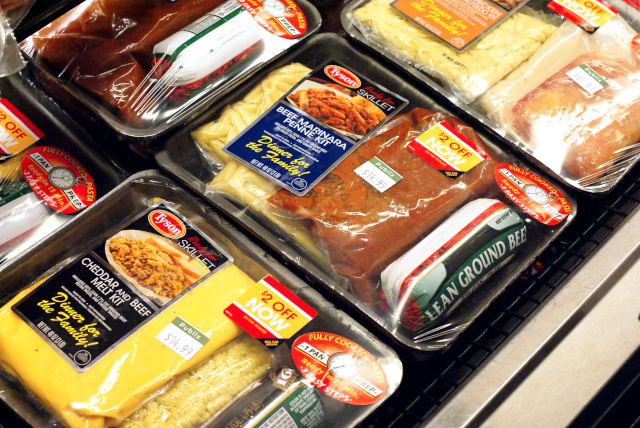 The convenience and easy prep when it comes to these kits makes them an ideal one-stop solution for a weeknight meal! And by convenience I mean everything you need for a delicious dinner is included in the kit and dinner is on the table in less than 15 minutes. Hellllllooooo, 15-minute meal. That's exactly what this momma needs to keep her sanity when time is of the essence! Oh, and we can't forget the bonus here...one skillet! 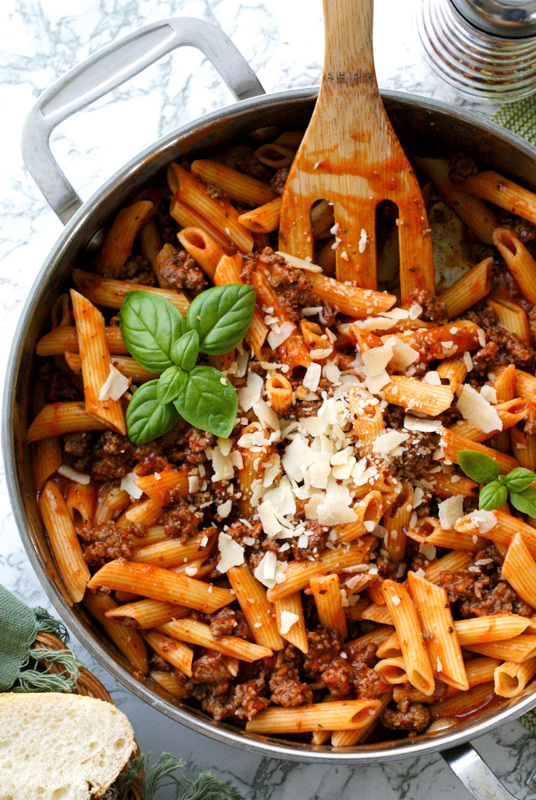 The pasta comes pre-cooked, so all you need is one pan to brown the beef and heat the pasta and marinara sauce. I suggest picking up a few of these so that an easy meal is never a problem! These are six varieties of Tyson® Ready for Skillet Meal Kits available at Publix! 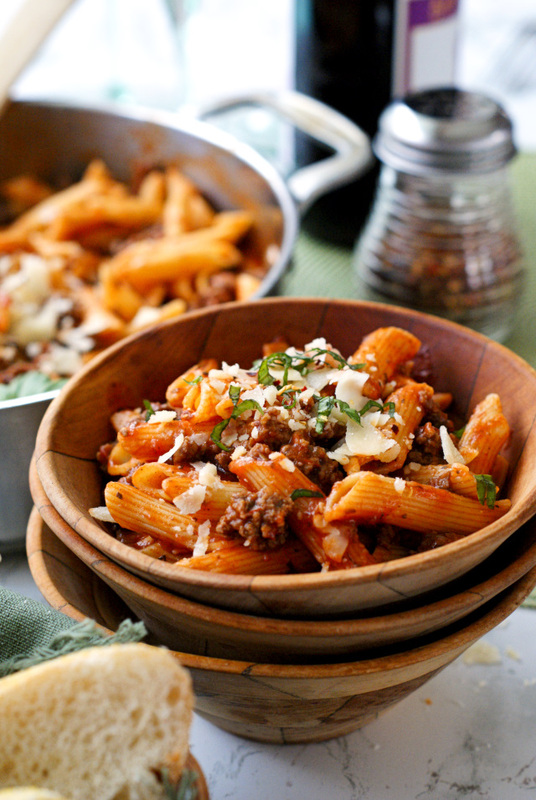 We enjoyed this Beef Marinara Penne and we really liked the Beef and Cheddar Melt kit, too! And did I mention that Tyson® also makes Ready for Wok and Ready for Slow Cooker Meal Kits? Love! Which Tyson® Meal Kit do you want to try? I've got my eye on the Three Cheese Chicken Carbonara. Look for them at Publix...my happy place! Brown beef in a skillet; drain. Add the pasta to the skillet, stirring frequently until heated through. Add the marinara sauce to the skillet and stir until well mixed and hot. Garnish plates with shaved parmesan cheese and fresh basil. The Tyson® Ready for Skillet Meal Kits are perfect for customizing to your tastes. I think this Skillet Meal Kit would be awesome with some chopped mushrooms, bell peppers, or even a scoop of ricotta added to it! Join the conversation on social media by using the hashtags #tyson and #tysonmealkits!